With resident goose populations at record levels, we’re living in the good old days of Canada goose hunting. Opportunities for great goose hunting have never been so plentiful. I enjoy shooting big Canada geese over the water. When they are low and committed over water, it’s a sight to be seen. But for pure numbers and for a more predictable hunt, nothing beats field hunting. There is a lot that goes into a successful field hunting. Scouting, concealment, calling, decoys, and much more. As far as decoys are concerned, a good spread for most hunters is five to eight dozen decoys. They don’t all have to be top of the line dekes. If you’re budget is small, mix in silhouettes. I designed a stake system for my inexpensive floaters and use them in the field as well. If you hunt with others, share the costs with your hunting partners. Once you get a good spread, pick up a half-dozen or so every season to replace decoys that are starting to look shabby or just to bolster your flock. Big outfitters in western states will use up to a thousand decoys in a spread. But thirty or forty will get you started and sixty to one hundred will make you look like you know what you’re doing. At least you will look like a serious goose hunter to the folks at the gas station at 4:30 AM. Big numbers of decoys are great. But you need to know what to do with them. Here are my three favorite goose spreads and how to deploy them. This decoy rig should be utilized in September when birds are not yet in big flocks. Place decoys in family groups of four or five. If you can change the poses, some families should have one sentinel and some with two, but most of the dekes should be feeding. You want to make things look really relaxed. I’ll have most of them facing each other like they are eating dinner together. It sounds kind of funny, but the geese seem to respond to it. Place the family groups in front of the shooters, but the furthest decoy should not be more than 20 yards in front of the shooters. 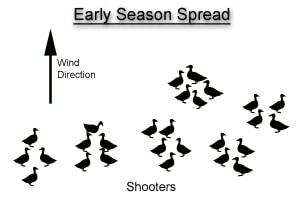 As is the case with all decoy spreads, shooters should have their backs to wind. Geese will almost always land into the wind, especially into a field. Having the wind at your back will allow for optimum shooting angles. If it’s possible, the sun should be at your backs as well. This serves a few purposes. Shooters won’t have to look into the sun while shooting. But more importantly, geese will be looking into the sun while approaching you from downwind. This decoy spread is the old reliable of decoy rigs. It can be used on water or land and is equally potent on ducks and geese. The idea is to look like a lot of birds feeding while leaving a wide open landing area right in the center of the spread. Theoretically, this landing area will act as a magnet to approaching geese. In practice, birds do seem to like it. However, I often have them land short at the tip of one of the arms. For this reason, I try to keep the arms short while goose hunting in fields. On the water, geese and ducks will swim in most of the time and give you an opportunity to shoot them trap style. In fields, they seem to figure out the decoys a little easier and usually walk or fly off. A variation of The Classic Crab is the J-Hook. 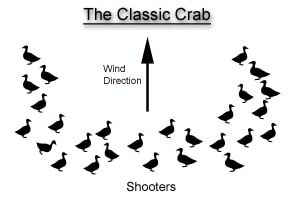 The J-Hook is made by removing one of the arms of the crab. If you’ve ever hunted for diving ducks, you know this technique well. It’s meant to give birds a line to follow into the spread. It’s also effective at opening up the landing pocket on days with variable winds. Geese don’t like to fly low over other geese, so if the wind is variable, this spread gives them landing options from two different directions. This is my favorite spread for late season hunting. The easy pickings in fields are long gone and birds become less organized in fields. Randomly place your decoys in a big glob as if they have spread out looking for food. Since you are spreading the decoys out more, place your layout blinds right in the middle of the dekes to keep shooting distances ethical. I place the farthest decoy at twenty yards. This gives me good, close shots and a forty yard by forty yard spread (twenty behind, twenty in front, and twenty to each side). Cover your blinds with surrounding natural cover because you will be under more scrutiny right in the middle of the spread. Like the other formations, most of your decoys should be in feeding poses. Some hunters like to mix in goose kites or wing flappers. I’ve seen mixed results with them. Sometimes they bring birds right in and sometimes they don’t get any kind of reaction. I think they are great for getting a flock’s attention. But once they turn in your direction, shut it down and be still. Any unnatural movement will change their minds and prevent you from clicking your safety off. One of the most important aspects to having success with small spreads is choosing the right spot to hunt. The advantage to big spreads is that it is visible from long distances. With a small spread, being where the birds want to be is a necessity. Scout with precision. It’s not enough to know what field geese are gravitating to. You have to know exactly where in the field they are going. Birds will favor one spot in the field over others due to contours in terrain, wind direction, and proximity to tree lines and other places predators can hide. Having quality decoys will also help. Some of those giant permanent decoy spreads used in the south utilize milk jugs to help fill out the spread. The belief is that there are so many spots on the water that some odd looking decoys won’t stand out. The opposite is true for smaller spreads. These decoys are going to be inspected, especially if geese make a few passes before setting their landing gear. Try to use as many poses as possible and if you can afford better decoys, buy them. Flocked heads and realistic molds can really make a difference. Hunter concealment is the key to everything. If the scouting is good and the decoys are perfect it won’t matter if geese look down and see hunters. A lot of goose hunters set their layout blinds on the upwind side of the decoys or sometimes right in the middle of the decoy spread. This works fine when there are a lot of decoys or the birds are uneducated. When hunting small spreads, set your blinds perpendicular to the wind direction. 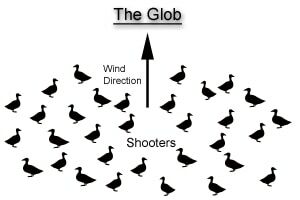 For example, if you’re hunting a north wind, set your blinds to the east or west of the decoys. When using blinds, stuff them with natural vegetation. Yes, it will take you an extra half hour to do so but the old days of muddying up your blind and calling it good are over. By now geese are getting wise to layout blinds and won’t tolerate them. Blinds have to look like part of the field. Remember those Duck Commander guys? Take a lesson from them and cover your face. Face paint can be a bit of a hassle but I prefer face paint to looking through a facemask all day. Goose hunting with small spreads can seem like a big disadvantage. But I believe small spreads have a lot of benefits. Just about everyone is hunting with as many decoys as possible. Geese begin to associate large decoy spreads with danger later in the season. The big advantage is mobility. No matter how good your scouting is there will be times when you strike out. Moving to another location is easy with a small spread. If you’re tired of the hassles of hunting huge decoy spreads, give goose hunting with a few decoys a try. It may become your preferred method of gunning for geese. Proper decoy placement when goose hunting is critical. The two different hunting setups –water and land have set up requirements unique to each. Only about 10 percent of goose hunters hunt on water, and they're usually duck hunters who want the "chance" to get a honker flying by over the waterway they're on. These duck hunters will typically throw out maybe a half dozen or dozen goose decoys in deeper water, away from their duck set ups. These "ersatz" goose hunters will, because of the few decoys they've got, necessarily spread out their goose decoys wide apart--15 to 20 feet--to make it look like a big bunch of geese is in the area. They hope that their goose decoys will generate some attention from fly-by honkers who MAY get interested enough to be drawn in close enough for a shot. It happens, but... well, let's just say, don't make any heavy bets on it. Over 90 percent of serious goose hunters hunt on land. You can't be haphazard with placement of land decoys. Find feeding areas (cornfields are great) where you can lay a large spread of decoys. Specific patterns and styles make goose decoys attractive for different reasons. Geese get "smarter" as the season goes on, and the more attractive the decoy set up, the more apt it is for a hunter to get a good shot. There are many different styles of goose decoys and include: Bedded down, "sleepers." Extended neck "feeders." Wing "flappers" (the decoy's wings will flap up and down, with motion provided by wind or battery). Then there's a new one called "goose skins;" and these are really neat. They're actual goose feathers that are attached to a malleable fabric, that is placed over a decoy--much like a "wig." And they really are a super attractant for geese. They appear very realistic, because the feathers ARE "real." You set your decoys up, in and around the location that you're going to be sitting in. You want to have them all around. And don't gasp--serious, savvy goose hunters will set out six to ten DOZEN decoys. What you're doing is trying to make it look like "the whole town's here, and everyone is invited to come and party." When it comes to goose decoys, guide Phil Schweik says it best: "The more the merrier!" When you set yourself up, you will want to position yourself so that the geese will be coming towards you as they land into the wind. Remember--geese will always land into the wind, so you want the wind at your back--and for sure you want the sun at your back, so you're not looking into it. Best time of day to goose hunt is early morning or late in the day. That's when the geese are coming in to feed and/or rest. Set up in one of two types of blinds: A regular "layout blind" (that's the one we described in a previous article--it's a flat box, often called a "coffin" in which you lie flat on your back, and pop up when the geese come in. Or many hunters build a "box blind" by using a series of stakes intertwined with chicken fencing/wire, and stuffed with corn stalks. Then just get a comfortable chair, sit back, have a cup of Joe, and patiently salivate as the big honkers move in.